We were looking for a house in the spring of 1987. A friend told us about an old two-story about to be listed. The minute I saw it, I knew we were home. When we looked at it the first time, it was a warm March day and as we looked around the yard, a hot air balloon was floating overhead. 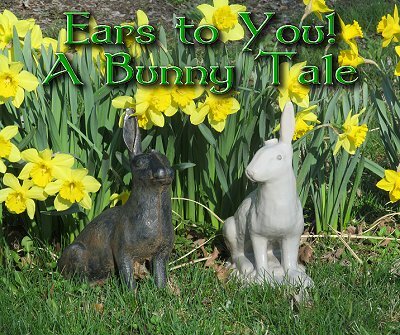 Emily, who was two at the time, was instead fascinated by a cast iron rabbit in a flowerbed. “Is she taking the cast iron bunny?” I asked. And he has. Happily sitting among whatever flower bed needs his attention. This week while driving home, I passed a pile of castoffs in front of an old farmhouse down our road. Surely that wasn’t what I thought it was. Pulling over I went to check. Sure enough, there he sat guarding the trash pile. A one-eared porcelain bunny. There was no question what I would do. Where else could a one-eared bunny go where he would find a kindred soul and a family who would appreciate him just as he was? Arriving home, I walked over and sat him down in the flowerbed. He looked at his new friend six inches from his nose, snuggled into the grass and knew he was home. Much has happened in this old house over the years. Two, then three little girls have run up and down the stairs, found ‘treasures’ in the woods, read thousands of books and brought home friends, most of whom had two ears. We have had little and we have had much but always God has provided enough to share. Despite storms that have raged, we have been safe and warm inside these four walls. Much like our cast iron bunny, we are a bit worse for wear. But we are still here by God’s grace. And by His strength, our home will always welcome those who need a kindred soul. Especially those with only one ear. To return to the Other Christmas Stories Page, click here. All information, data, text, and illustrations on this web site are Copyright (c) 2006, 2007, 2008, 2009, 2010, 2011, 2012, 2013 by Paul D. Race.